Thread: Repair or repaint 2" grayish trim on outside of rear salon windows? We have some minor damage to the grayish trim on the outside of the rear salon windows. The gray has been cleaned excessively in one spot and the paint? has been removed. Does anyone have experience or suggestions on repairing the finish? Re: Repair or repaint 2" grayish trim on outside of rear salon windows? The original stuff (at least on mine) was a Tiflex branded acrylic ink (encre vinylique brillante), but I suspect anything similar will do. Thanks for the pointer as to what you use. Anyone know the year/hull numbers when they moved from black to silver? Having just redone my windows, I'm pretty sure that the failure was due to lack of scuffing of the PMMA combined with a very thin layer of the betaseal which doesn't allow enough movement to cope with the thermal expansion. 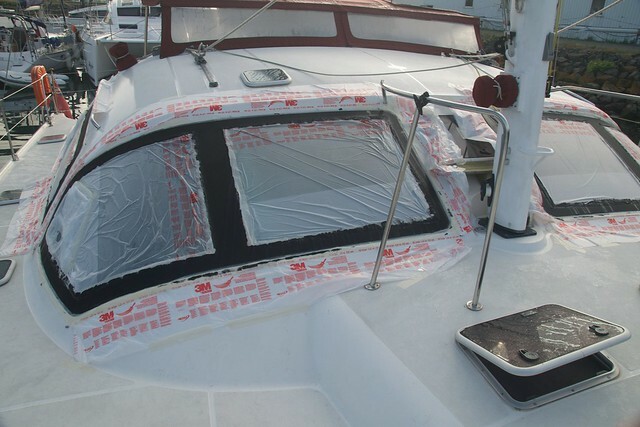 When we replaced our windshield and rebedded several other windows the yard used a high temperature engine paint (black). Aurora's advice is sound. Thank everyone for the responses. Google searching lead me to dickblick.com where I found the acrylic ink. The order number for the silverfish ink is. There is also a video showing the viscosity of the ink products. It appears that after masking off the area to be painted/inked a 2" foam brush would work to apply the thinnest ink which should not leave any brush marks. To make everything look good both windows would probably need painted as the original colors have faded. The real problem will be in masking and painting the area behind the helm station. This would also be a problem spray painting or air brushing. It is awkward doing behind the helm, but it is possible, honest! Let us know how the paint job went, I'd be interested to know. My decision to use the can paint was based on a very scientific experiment. I took a piece of 3/4" acrylic that I was using to replace my windows and painted it with eight different kinds of paint. Having let it dry, I then ran a screwdriver over it to see which one adhered the best and had dried hardest, hence my recommendation. wow - 19mm? I thought mine (oem) were thick at 15mm. The privilege 'window manual' says 10mm which surprised me. Do you find your windows are very proud of the fibreglass surround?